Started over 1 year ago by Heather Weck. Does anyone have any good recommendations for science-based, preferably chemistry-oriented, podcasts? As part of our district's holistic child initiative, I want to start a "Workout Wednesday" assignment where students need to do some type of exercise for about 20 minutes while listening to a podcast. We would then discuss it in class or I'd have them post to a discussion board. My issue is that I can't find any great podcasts. I've heard a bit of science-y stuff via 99% invisible, Criminal, and Freakonomics, but can't find anything that truly fits the bill. Does anyone have any recommendations? Thanks! Just came across this app one today so it may be worth a look: Science 360 Radio. 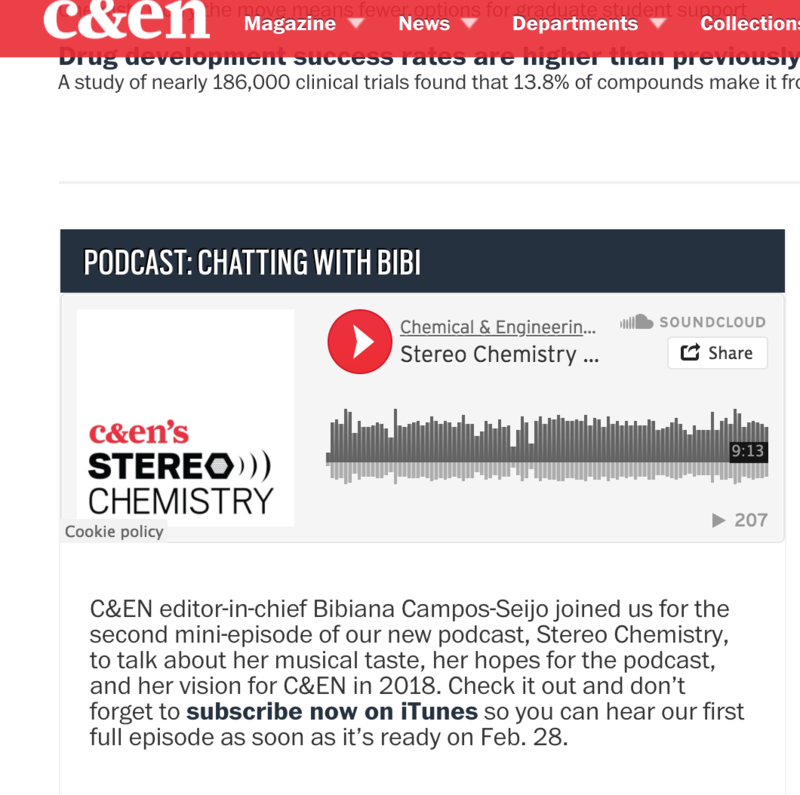 C&E News is starting a new podcast called Stereo Chemistry. It is available through iTunes and starts on Feb. 28th. You might want to check it out. I have attached a screenshot. I used to love Science Friday and another one called 60-second science. For the 60-second science podcasts, they could listen to a few and then report out on their favorite. You could also think about having NPR articles or news stories read to the class (the special education department has tons of these resources). Then the class can do yoga while listening and report out. I love this idea! I'm going to steal it and try it out with my kids. I will check back with their ideas, too. wow! You all are so much more helpful than Google was. I have a lot of listening to do :) Thank you! Radiolab and science Friday are my favorites as well. Radiolab is one of my favorites. I've had some good luck with Ted Talks as well. My students really enjoyed this and were amazed that someone would get harassed for supporting the use of the metric system. There are other good podcasts at this site which involve numbers.
. These are just a few podcast I came up with. I have't listen to all of them but have read a little about them.